Wespes et al. (2018) present the global fingerprints of recent changes in the tropospheric O3 levels measured by IASI over 2008 – 2017. 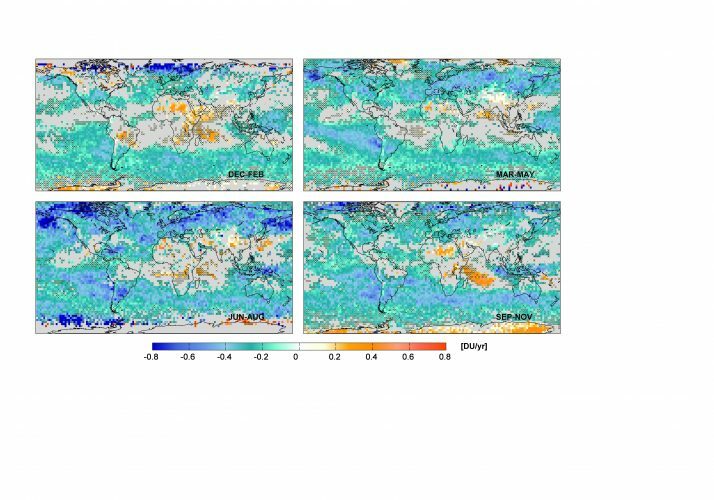 Using appropriate multivariate regression methods, we discriminate significant anthropogenic trends from various modes of natural variability captured by IASI. A band-like pattern of significant negative trends of ~|0.5| DU/yr on average is detected during summer in the mid-high latitudes of the North Hemisphere. The influence of continental pollution on that latitudinal band is supported by the analysis of the IASI O3-CO relationship.